The revival of Russia’s Moon and Mars space exploration programs means that the country’s rocket industry has resumed development of heavy rockets. The new Angara and Yenisei rockets are a step toward craft capable of carrying payloads of hundreds of tons into orbit. Russia's space exploration program has now been fully refocused on long-distance expeditions. These include a gradual exploration of the Moon, a program that has been abandoned for 40 years, and – in the longer term – manned missions to Mars. Both require heavy carrier rockets capable of taking hundreds of tons of payload into orbit. Lunar expeditions are impossible without creating super-heavy carrier rockets with a payload capacity of 74–140 tons. "In order to fly to the Moon and come back, a dual-rocket mission is required, with two rockets having a payload capacity of 75 tons. If a rocket has a lower load capacity, 25-30 tons, as is being proposed, then even lunar exploration plans become absurd," says Vitaly Lapota, head of a leading Russian space corporation, Energia. At the moment, Russia's largest rocket in operation is the Proton, which has a payload capacity of 23 tons for lower orbits and 3.7 tons for geostationary orbit. Russia is also developing a new family of rockets, Angara, with a payload capacity of 1.5 to 35 tons. Why revive the Russian lunar program? The first launch of the light variety of the new rocket is scheduled to take place at the Plesetsk cosmodrome early this summer. The Russian Federal Space Agency (Roskosmos) has also announced plans to create a heavy version of the Angara, capable of taking payloads of 25 tons into a low orbit. Yet, these characteristics are not sufficient for carrying out interplanetary missions and for outer space exploration. According to Roskosmos head Oleg Ostapenko, a proposal is being drafted, to be submitted to the government, for the creation of a super-heavy rocket capable of taking payloads of over 160 tons into a low orbit. It is hard to say how soon these plans may be implemented. Yet the Russian rocket industry does have a certain foundation on which to build further efforts to create heavy-lift launch vehicles. In the late 1980s, a heavy liquid-propellant rocket called Energia was created, with a low orbit payload capacity of up to 120 tons. Although a full revival of this program is not yet on the cards, rough designs of a heavy carrier rocket on the basis of the Energia are definitely available. The new rocket could make use of the Energia's key element, its successful liquid-propellant rocket engine RD-0120. A design of a heavy rocket using these engines exists in the Khrunichev Space Center, which is in charge of producing Russia's only heavy rocket, the Proton. The proposed new rocket, on which work began back in 2008, is called Yenisei-5. The 75-meter-long rocket will have a first stage consisting of three oxygen-hydrogen RD-0120 liquid-fuel engines. Khrunichev Center experts believe that this program could be easily revived. Furthermore, in future these engines could be used multiple times. However, in addition to its obvious strong points, Yenisei has one serious downside: its size. Most of Russia's future space launches will take place from the Vostochny cosmodrome, currently being built in the country's Far East. At least, this is where future heavy and super-heavy carrier rockets are supposed to blast off into space from. However, the diameter of the first stage of the Yenisey-5 rocket is 4.1 meters, which does not allow it to be transported by railway unless the current railway infrastructure has first been upgraded. Plans for developing a Russian heavy rocket are quite optimistic. In mid-May, Oleg Ostapenko said that the Russian Federal Space Program for 2016–2025 will envisage efforts to design a super-heavy carrier rocket with a payload capacity of 70–80 tons. "The Federal Space Program has not yet been approved; it is being finalized. We shall publish it in the near future," he said. Carrier rockets should be fit to resolve a broad spectrum of civilian and military tasks. They should be not only powerful but more efficient too. 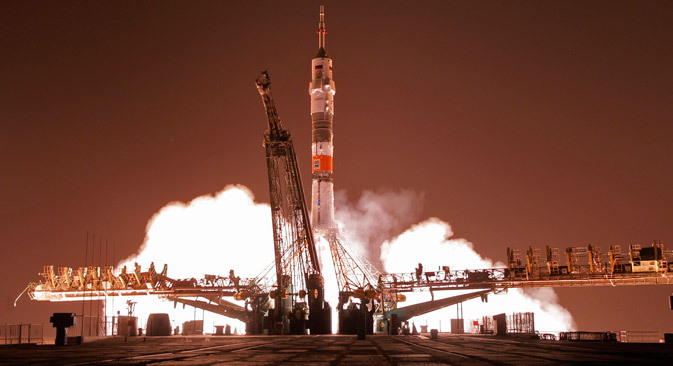 Therefore, Russia should consider creating a reusable heavy-lift rocket. Switching from expendable heavy-lift launch vehicles to reusable ones makes it possible to considerably reduce the amount of hardware that needs to be made. Savings made through reducing production volumes are approximately the same as the costs of creating a reusable rocket. Will China overtake Russia in the space race? The USSR had designs for developing a reusable launch vehicle: The Mikoyan design bureau was working on two projects for suborbital spacecraft. The first envisaged an accelerator aircraft, the other a Soyuz rocket with an orbital aircraft. The two-stage aerospace system was called Spiral, or the “50/50 project”. An orbital rocket plane took off from atop a powerful Tu-95K carrier aircraft at a high altitude. On liquid-fuel engines, it reached a low-earth orbit, performed set tasks there and returned to Earth, gliding in the atmosphere. A full-scale model of the rocket plane performed several flights. Thus, reusable launch vehicles are not such a novelty for Russian designers and engineers. Given the emphasis now being placed on increasing satellite systems, interplanetary travel and outer space exploration, one can safely predict the need to develop reusable launch vehicles, including heavy carrier rockets. First published in Russian in VPK-news.